What if your recipe calls for fresh herbs, but all you have is dried herbs? 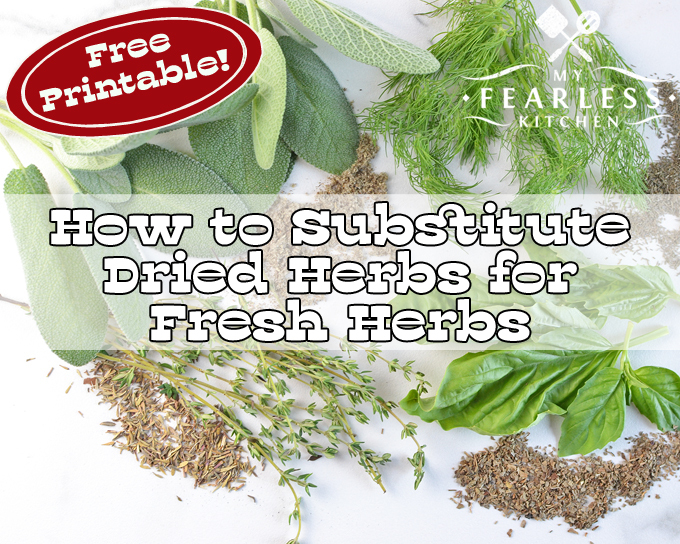 Find out how to substitute dried herbs for fresh herbs and get a free printable. Can I Use Dried Herbs Instead of Fresh Herbs? I love cooking with fresh herbs. But it’s not always possible. Fresh herbs don’t stay good as long as dried herbs, and I can’t always find the fresh herbs I need at the grocery store. So I keep a well-stocked spice cabinet with a supply of dried herbs. But when the recipe calls for fresh herbs, how much of the dried herbs should you use instead? Dried herbs have a more powerful flavor than fresh herbs because the flavor is concentrated in a smaller package, so to speak. 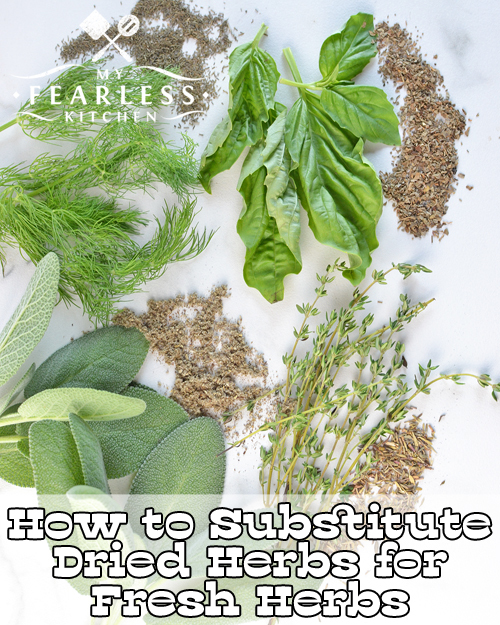 So you can use less of a dried herb in place of a fresh herb. The basic conversion is pretty simple. If a recipe calls for fresh herbs, you want to use 1/3 of that amount in dried herbs. So if your recipe calls for 1 Tablespoon of fresh parsley, you can substitute with 1 teaspoon of dried parsley. But it’s not so easy to measure 2/3 or 1/3 of a teaspoon if you need a different amount. (Why don’t they make that size measuring spoon, anyway?) You can refer to the image below to see different substitution amounts. Do you want a printable version of this chart to keep in your kitchen for fast reference? Click here to download your free printable. Can I Use Fresh Herbs Instead of Dried Herbs? Of course you can! Just do the conversion in the opposite direction. If the recipe calls for 1 teaspoon of dried basil, then use 1 Tablespoon of fresh basil. That’s it! These herb scissors will make prepping fresh herbs fast and easy. And this Stainless Steel Magnetic Spice Rack from Pro Chef Kitchen Tools will keep your favorite dried herbs at your fingertips. These long and skinny measuring spoons will fit in any size spice jar. Thanks for this information. I was never really sure about the fresh or dried herbs ratio was. It is sometimes hard to find fresh herbs in the Winter. Twitted & Pinned. Congratulations on being featured on Homestead blog hop.